Riding aboard a Navy submarine, boat or ship, can sometimes get boring. Books and cards can only take you so far. So, it appears that some sailors have taken up vaping to pass the time and form social bonds. And the Navy is cutting that out quick because there have been... problems. It has nothing to do with not being able to see through the thick clouds of vapor, either. It’s because 15 “mishaps” happened between Oct. 2015 and June 2016 that resulted in fire or material damage, reports NPR. Four of the 15 occurred when the battery exploded while the user was puffing on the vape, causing face and tooth injuries. The ban will be effective on May 14 and will extend indefinitely. 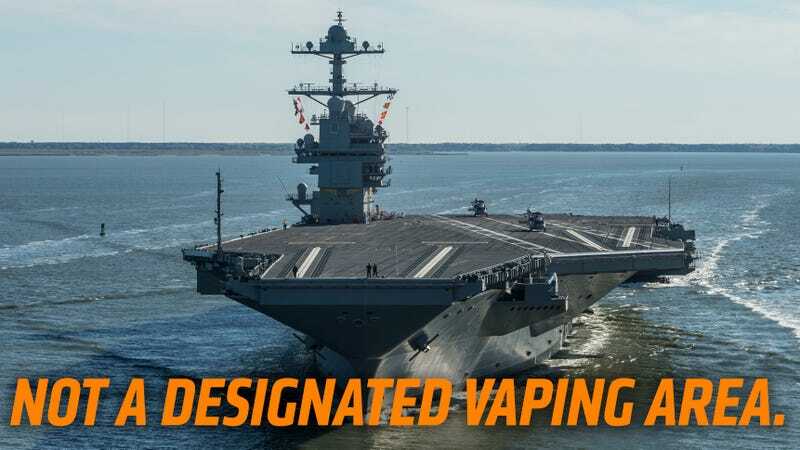 Sailors can vape when on shore and on base, but only if they do it in the designated areas. Something something a joke about sailors also driving Subarus.